Today we are excited to announce the release of WPForms 1.4.5! This is one of our biggest releases to date. We added a lot of exciting new features that will help you create and customize advanced WordPress forms with just a few clicks. Let’s dive right in and see what’s in store for you. Before today, adding images next to your multiple choice fields in WordPress forms was not easy. If you wanted to create an order form with product images or survey form with image choices, then you had to follow a tutorial that asked you to add custom code and CSS which was not easy for beginners. At WPForms, our goal is to make the most beginner friendly WordPress forms plugin, so we tackled this problem head-on and solved it for our users. 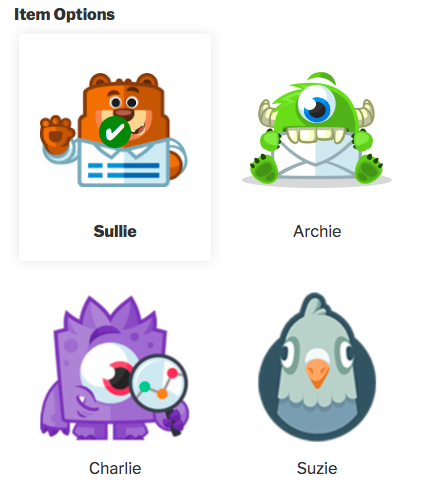 Now you can easily add images to your checkbox, multiple choice, and multiple choice payment fields with just a few clicks (no coding necessary). 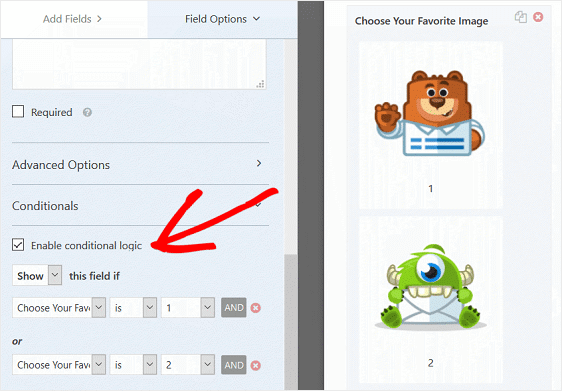 All you have to do is enable the image choices feature under field options and then upload your images for each choice. Our multiple choice images feature lets you change the layout, choose a style, and even randomize the order of your image choices. It even works with our smart conditional logic, so you can show or hide fields based on your visitor’s selection. And the best part is that you get this feature at no additional cost because you’re a WPForms Pro user. No other WordPress form builder has a feature like this because it’s complicated. But simplifying complicated features like this is how we earned our reputation as the most beginner friendly WordPress form plugin in the market. 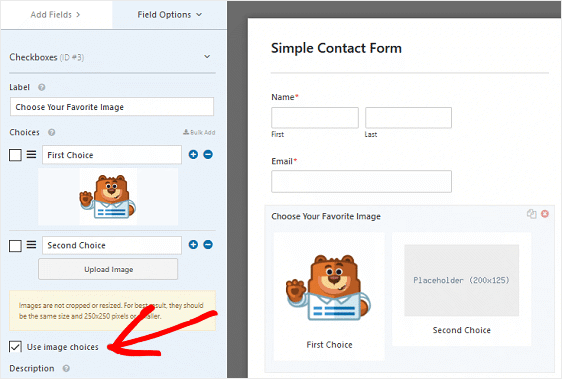 For more details on how you can add multiple choice images to your forms, check out our documentation on adding image choices to WPForms. With rising privacy concerns, and the fact that privacy laws are tightening, we want to make it easy for you to comply and let your site visitors know their data is protected. So we have created a way for you to add a terms of service checkbox to your form, and display it in a scrollable text box. This ensures that your form isn’t overloaded with text, and the information is visible to the user without leaving the form page. Better terms of service field like this not only makes your form more user friendly, but also help reduce form abandonment. For step by step instructions, check out our tutorial on how to add disclaimer/terms of service agreement formatting to your forms. If you are looking for a way to format specific fields, then you’re going to love custom input masks. For examples of basic and advanced input rules, check out our complete guide on how to use custom input masks in WPForms. No WPForms update is complete without some under the hood improvements designed to make your experience better than ever. And this time, it’s all about the form editing speed and performance. In the past while WPForms worked great for simple forms, the form editing experience would slow down as you started to add hundreds of fields in a form. Well that’s not the case anymore. Even with hundreds of form fields, you’ll experience a whopping 500% faster form editor than before. That’s all for this release. We hope you like the new features and improvements. Go ahead, give it a try and let us know your feedback. Don’t have a WPForms Pro license? Click here to Get started today and experience the WPForms difference. Thrilled to see a leap in the code efficiency, and some cool additions to WPForms. When will WPForms allow one or more columns, side by side? We actually already have a tool in place to create multi-column forms. Here’s our tutorial where you can find all the details. Custom input masks is a feature I’ve been waiting for… Super excited to see it integrated! Is there a way to add a quantity? So If I choose image 1, but I would like to add/increase the quantity of that choice is there the ability to do so? Thanks for the reply. Good to know that it’s being considered! I’m loving the new Single Line Text field Input Mask but this feature should be available on most other fields as well. Especially the phone number and address fields. For me to utilize this feature, I will now have to rebuild my entire form. And there’s is a lot to it. This is a step in the right direction though. Thanks for the suggestion, and I’ve noted that on our feature request list for consideration. For now, I hope that this feature is helpful to you! Custom Input Masks! The feature that I never thought would appear! Thanks! Awesome. Thanks folks. Any way you can put on your to-do list adding a coupon code field (pretty please)? Hi, I am WordPress developer, can i create form for forex trading company ? like e.g. bookmyforex.com, i want to dislay their todays rates on forms, can i do this with wpforms ? can you help me in this ? The ability to pull data like this from other sites would require custom code, and so I apologize as we’re not able to provide support for the custom development that would be required. In case it helps, you could consider looking into a service such as Codeable or Upwork for potential developer options. On use of form, fields designated as multiple-choice do NOT allow multiple selections. Please Help. I apologize for the confusion, and it sounds like the Checkboxes field will be a better fit for what you’re describing. While the Multiple Choice field only allows the user to select one option (sort of like a multiple choice question on a test), the Checkboxes field allows any number of options to be selected. we have a question. We are WPForms Basic User an built a simple form. But we dont want to have a multiple choise option. We took checkboxes with “yes” or “no”, but the user can choose both fields if he want. But we want him to choose just one option. If the choose yes, it should not be possible to choose no. I hope you understand my qustion. Sorry for bad english. Same problem mit multiple choice fields. Do you know whats the problem? If I’m understanding correctly, it sounds like there may be some confusion between our Multiple Choice and Checkboxes fields. In case it helps, our Multiple Choice field will only allow a single option to be selected (sort of like a multiple choice question on a test) — which sounds like what you’d need in this case. I have an issue with my wpform, the page scrolls down to the end of the form when an image choices are pressed. Is there any way to disable the scroll? I wasn’t able to replicate that issue on our testing site so can you please contact our support team with a link to your site (and specifically the form) so we can test it out and find a solution for you?